Share your Favorite Spicy Tailgate Treat — Win Some Purr-fectly Good Hot Sauce! What’s your favorite football-inspired food? The folks at Fat Cat Foods want to know — and so do we. The big game’s right around the corner, and we’re preparing ourselves for those big hits, amazing plays, hilarious commercials — and, of course, some terrific tailgate-inspired food. We’re already dreaming about our favorite football recipes — but what about you? What spicy treats will you be eating and serving on Super Bowl Sunday? Delicious flavor here trumps the heat. Amazing! That’s why we’ve teamed up with Fat Cat Foods [www.fatcatfoods.com] for this fun giveaway. 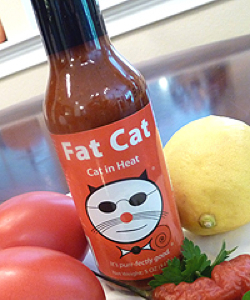 Tell us what you plan to eat or serve on Super Bowl Sunday and you could win 2 bottles of Fat Cat hot sauce and an awesome tee shirt — including their latest creation, the smoky, scorching Cat in Heat [see our review]. HOW TO ENTER: Tell us what your favorite spicy tailgate treat is in the comments below. The comments can be about anything, not just Fat Cat-based dishes. Feel free to include recipes or unique ingredients if you want (you’ll get bonus points for doing so), though that’s not necessary. Each unique comment counts as one entry in the contest. Comments must be posted by midnight of January 31, 2013 to be eligible for entry. Back view – front is pocket image. Nice shirt! 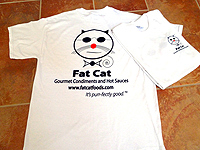 PRIZES: Winners will receive a bottle of Fat Cat’s newest hot sauce, Cat in Heat, as well as one additional bottle of their choosing from Fat Cat’s line-up [http://fatcatfoods.com/our-products/] and one Fat Cat T-shirt (sizes adult S-XXL). Two winners will be selected at random from the eligible comments below. Winners will be notified and announced on February 1, 2013, and prizes will ship on February 4, 2013. So what are your favorite spicy tailgate treats? Tell us below. BTW: Fat Cat’s favorite tailgate treat is Big Dog Tina’s Fabulous Fat Cat Beer and Cheese Dip. Here’s the recipe [http://fatcatfoods.com/2012/02/recipe-big-dog-tinas-fabulous-fat-cat-beer-and-cheese-dip/], in case you want to try it yourself! Congrats to our Big Winners: Kelly Ann T. and Christopher Sorel! And a big thanks to everyone who entered! If you’d like to see more giveaways and contests on HotSauceDaily please let me know. Click the Contact tab at the top of this page. On grill: Cut top off of empty beer can. Fill 1/3 with beer of your choice, add cheese (block melting cheese works very well) to melt in beer can. Cook bratwurst. Once cheese has melted, add 1/2 onion diced, salt, pepper, 1 tbs sage and hot sauce to melted cheese. To serve: toast bun, to it add a good slather of cheese, top with brat and enjoy!! Wow! And so we begin with a really different and obscure recipe that sounds awesome! Thanks Craig C ! Thanks! Nothing says tailgaiting like grilling up some brats! I love a turkey chili recipe and some fat cat – cat in heat to kick it up a notch! Ground turkey, browned in with sautéed onions and lots of garlic then put in crock pot with white beans, black beans, diced tomatoes, tomato sauce and a dash of red wine vinegar! Then serve over rice – delish! Mine has to be a classic spicy queso dip made with velveeta cheese and rotel, add some bhut jolokia powder and a fresh moruga scorpion to heat level and enjoy! Bacon wrapped chicken! Chicken marinated in Thom Toth’s bacon hot sauce. wrapped in bacon and rolled in brown sugar with volcano dust! Yummy goodness!! Can’t go wrong with bacon it goes great with football!! By the way Thom’s sauce is called Porcus Infernum!! VooDooChilieSauces.com. Love his sauces!! Super Bowl- Venison tacos!!! Ground venison cooked with onion, garlic, Chili powder, cumin.Served on hand made corn tortillas with guacamole, cilantro, cabbage, and radishes. Bacon wrapped jalapenos and roasted habaneros crusted with salt on the side. Margaritas made with fresh tangelo juice for everyone except me!! Thought of another one: Mexican Dip with Taco Bell Lava Sauce. Jamaican Jerk Beef kabobs… Buffalo chicken kabobs and Tequila Lime shrimp kabobs with tortillas fresh Pico de Gallo, Tomatillo Salsa Verde and Guacamole! Use celery, crackers, or chips as dippers. Rachael, what food do you dip into this amazing spicy mayo?? Thanks for the recipe link. It’s on my to-do list in Evernote now! Kettle chips loaded w may tag blue cheese crumbles, broiled, drizzled w balsamic. Just plain potato chips (albiet “kettle style”)? Sounds good. Can you elaborate? Using a broiler safe baking dish or foil lined baking sheet – lay out a bag of kettle style chips (I use plain but you could experiment with flavors). Chunk or crumble blue cheese (Maytag is my fave too) over the chips. I like a lot but the ratio is up to you. Drizzle with balsamic vinegar (or your favorite hot sauce, for that matter) and broil just until the cheese heats through and the chips have a few dark edges. Remove from the broiler and slide them into a serving dish. Maytag blue………..mmmm, FAVE blue cheese ever!! Down here in Mississippi, I’ll be feasting on some spicy boiled crawfish for the Big Game. Yum! Nice, Blake. What do you eat them with? Sauce, dip, details please! My standard dip is ketchup, horseradish, worcestershire, lemon juicy and salt and pepper all mixed together. Also, love a little hot sauce on top the crawfish. Sounds good Blake! Our go-to “cocktail sauce” is simply ketchup and Heinz Chili Sauce… with a healthy dose of good horseradish. Pretty similar to yours, but I’ll try your recipe next time. I am biased but our lobster roll made spicy with the award winning purry purry fat cat hot sauce. The papaya passion and Caribbean Curry also are a nice match. Our customers love Fat Cat Hot Sauce. Let’s Roll!!! Bacon wrapped jalapeno poppers filled with smoked gouda, pulled pork and cream cheese, smoked over cherry wood. Can’t go wrong with that, Shane! Sounds good Jonathan! But… which Sriracha wings? since I am in a Dorm and only have access to a microwave for cooking, I am going to be making my own hotwings, with a bleu cheese dipping sauce and maybe some lovely nachos with a nice homemade dip. Very nice Brian Simpson! We want details… tell us about your dips. Saute onions, garlic, peppers, and brown the sausage. Add tomatoes and salt & pepper to taste. Mix in the cream cheese, and simmer until desired dip consistency. You could always do this in a crock pot. Sounds awesome, Miguel. But… if we don’t have access to fresh Datil peppers, what do you suggest? Datils have that sweet smoky heat that goes great with this but go with what ever you have around. If worst comes to worst some good old jalapeños will work out. So I take it you are a fan of Dat’l Do-it sauces? Or maybe Dat’s Nice, or A Frame Datil sauces? I love the A frame sauce, it’s a sweet sauce that reminds me of Franks Red Hot Sweet Chili, but with a Datil kick. A Taste of St Augustine makes a great spicy Datil sauce called Snake Bite. Its currently my favorite hot sauce period. This must be a WV thing, Nita. I’m intrigued by the concept… the wings would turn out very moist. Not crispy or crunchy at all. For me it’s gotta be BBQ’d stuffed jalapenos. 4. Grill to perfection. When the beef is cooked, the jalapeno evenly scalded (not burnt!) and cheese starts oozing out a bit, they’re good to go. 5. nom nom nom nom nom! 6. food coma, enjoy the game. I’ll send you the address – I wear an XL. So you cook the beef in the pepper/popper on the grill? It’s not a pre-cooked beef mixture? Radical! I love fried them grilled hot wings. I will be throwing some on this Sunday. Just fry the wings till cooked. Toss in your favorite hot sauce and the grill for 3-4 minutes. It caramelizes the hot sauce and makes the super delicious. WOW! A reverse sear of wings of sorts. Fry first and *then* grill ’em with the sauce. Gotta try this alternate universe method of fried wings on the grill! Thanks Rex! Brian it is actually pretty awesome. It dries the wing sauce out a bit so they are a little cleaner to eat, but it maintains the heat. Plus it adds an extra layer of smokiness. It is my favorite. Word! Thanks Chris. moink balls rock! Game day food has to be smoked pork shoulder…sandwiches, nachos, or just straight up. Plus if you are doing it right you have plenty for leftovers! steamed buns and hot wings…Nothing better! Hey Aaron! What the heck are steamed mustard dogs? Educate us Marylanders and the rest of the country. I mix refried beans abd diced jalepenos for layer one. Layer two is sour cream with taco seasoning sprinkled on top. Layer three is homemade guacamole. Layer four is salsa. Layer five is sharp cheddar cheese. Layer six is diced tomatoes. Layer seven is diced onions. Layer eight is green onions. Sometimes I will add ground beef or bacon. Wings with my own sauce. We like a high zest and some solid heat in our mix. Sounds good Greg. What’s in it? Wow, really? David? Hot Sauce? I never would have guessed! Chili is so versatile, and I always try to keep some in the freezer for those nightswhen I want some slightly spicy comfort food. We’ve had it on pasta, on nachos, with Frito Scoops, and in the bowl (of course).